Looking down Jones Hill from the intersection of Downer and Sawyer Avenues. As you can see, a variety of housing styles—from the large old house at 76 Downer to the later two-family houses and triple-deckers—line the streets of Jones Hill. Over the past 175 years, the character and function of Dorchester have both changed dramatically. Originally, Dorchester was a collection of large estates and farms. Dorchester was largely unsettled—all of Carruth Hill, today the neighborhood to the east of Ashmont Station on the Red Line, was once one big swamp. 1831 map of Dorchester by Edmund Baker. 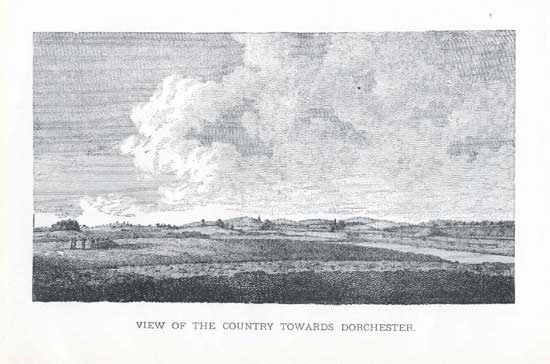 In contrast to the densely-settled area of today, the Dorchester of yore was a spread-out collection of large estates. Circled in blue is Jones Hill. A view of Dorchester from Boston from around 1775. Note the expanse of open, undeveloped land. Naturally, real estate development along the new train corridor boomed. The new Dorchester residents were primarily upper middle-class families—train travel was still relatively expensive. Accordingly, the homes built were large, architecturally-significant houses on large lots closely packed but spaced far apart. 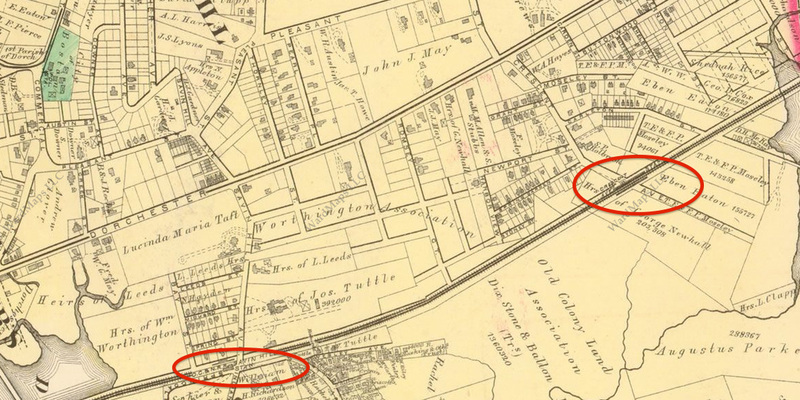 1874 G. M. Hopkins map showing development around the Crescent Avenue and Savin Hill Stations, both circled in red. Much of the Savin Hill neighborhood was occupied by the Tuttle estate, which extended all the way to Romsey Street by present-day JFK/U-Mass Station. At one point, the estate extended onto Savin Hill itself, but the estate was divided by the Old Colony Railroad in the mid-1840s—as shown on the map, the Tuttle family still owns land across the tracks. Even as Dorchester continued to be subdivided and developed, some landowners continued to hold onto their Dorchester estates. Yet even so, many estates around both stations have been subdivided and are now home to new large, suburban houses with big backyards. 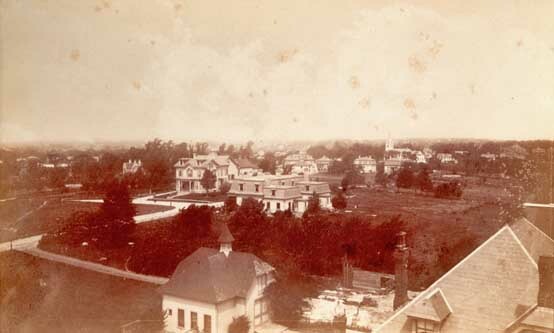 1870s/1880s photograph of Dorchester's Ashmont Hill showing the development that took place around railroad lines—many large suburban homes with large grounds. As you can see from the 1874 map above, much of the land on Jones Hill was also subdivided in response to the train's construction. Yet by 1874, the hill remained largely unsettled. Land in walking distance of the train station yet away from the bustle of passing trains, particularly at the top of the hill, was more desirable and accordingly much more expensive. Accordingly, in 1874 much of the land at the top of Jones Hill was still owned by the Sawyer family, namesake of Sawyer Avenue, and other landowners, such as the Thachers, a well-to-do Boston merchant family. Many large estates remained—soon these would be subdivided as well. At the foot of Downer Avenue was the estate of Samuel Downer. Downer was a scientist notable for inventing kerosene solution, which was used for some of the earliest lighting solutions and is used to this day for jet fuel and other applications. Downer's home dated back to the 1830s and was demolished in the early 1900s. The Downer estate was subdivided beginning in 1870, when Downer Avenue was cut through the estate. The grounds of the Downer estate are said to have been especially grand, owing to Downer's passion for gardening as the director of the Massachusetts Horticultural Society. 1874 G. M. Hopkins map of Jones Hill and parts of the Savin Hill neighborhood showing estates both subdivided and not. At the foot of Downer Avenue is Samuel Downer's estate. A kerosene lamp. Image taken from lightingtheplanet.org. By 1889, further change was in the air around Jones Hill. Fast electric trolley lines with inexpensive fares were beginning to be built along the streets of Dorchester, as well as other Boston neighborhoods and suburbs, catalyzing a second boom in real estate construction. Suddenly, multifamily apartment dwellings were to be found across the streets from estates! For the next twenty-five years, Dorchester would be a community in transition with a particularly unique variety of residents—from lower middle-class apartment dwellers to estate owners whose families had called Dorchester home for generations—and housing styles. 1889 Bromley map of Jones Hill, a community in transition. On Pleasant Street, a row of brick apartments, signified by their pink color (yellow = wood, pink = brick), now stands across the streets from longstanding Dorchester estates. Electric trolleys, not shown, now run along Stoughton Street, Pleasant Street, Savin Hill Avenue and Dorchester Avenue. Downer's estate remains at the foot of Jones Hill, yet the hill is now home to many more dwellings than before. Even so, there is lots of available land on and around Jones Hill, extending into Savin Hill. 1925 Boston Elevated Railway transit route map showing the electric trolleys that ran around Jones Hill. Before the construction of the Washington Street Elevated through the South End and Roxbury, many of these lines ran all the way to downtown Boston; afterwards lines were generally cut back to Dudley Station. Dorchester's building boom continued well into the 20th century. With electric trolleys, which were quick and affordable, Dorchester was now an attractive place to live for a range of Bostonians, from businessmen to workers. From the 1890s onward, the predominant construction in Dorchester, as well as in Jones Hill, was multifamily dwellings—two-family houses and triple-deckers—with some single-family construction as well. By 1898, significant construction has taken place. The estates along Stoughton Street have been significantly subdivided and are now full of multifamily dwellings. New streets have been cut around Jones Hill into Savin Hill, and the new streets are surrounded with new construction. Worth noting is the Tuttle House by the Savin Hill Avenue-Tuttle Street intersection: once extending almost all the way to Crescent Avenue Station, present-day JFK/U-Mass Station on the Red Line, the Tuttle Estate has become a new neighborhood, and the old house stands on a fraction of the land on which it once stood. 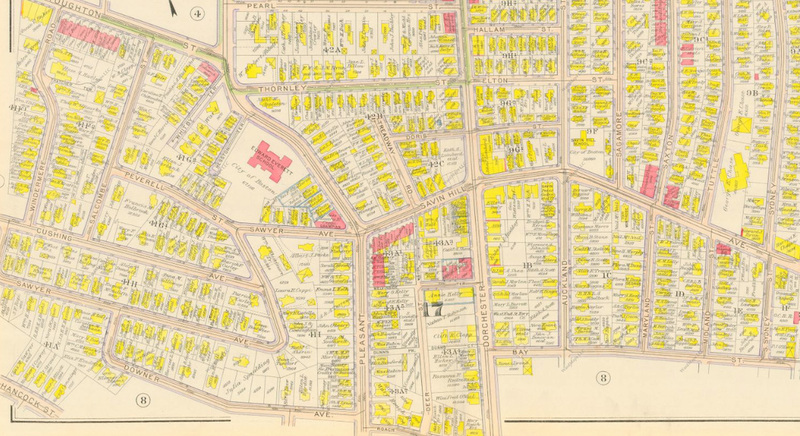 1898 map showing new subdivision and multifamily dwelling construction around Jones Hill. 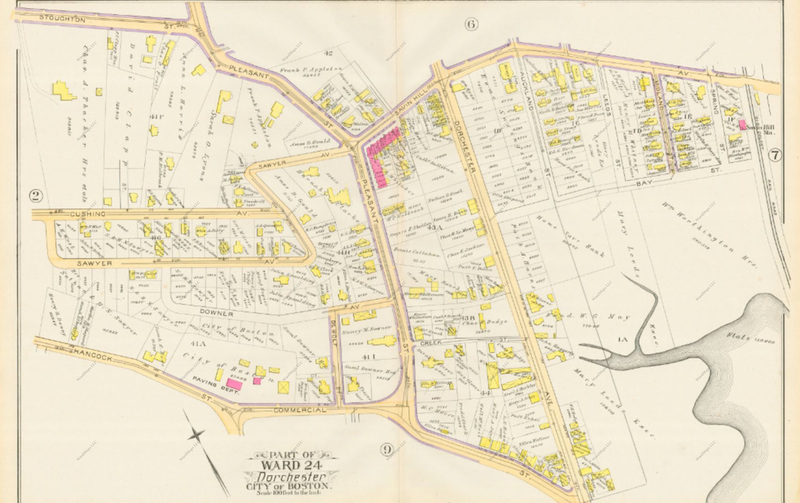 By 1918, Dorchester was almost unrecognizable when compared to its suburban past. Electric trolleys had absorbed Dorchester into the urban fabric of the city of Boston, and as a result the area was now a "streetcar suburb," a neighborhood full of multi-family dwellings and shops centered around trolleys. Some of the old homes remained, particularly the Tuttle estate, however many other original estate houses were demolished with multi-family dwellings built in their places. 1918 Bromley map showing Dorchester's new densely-packed "streetcar suburb" streetscape. While the trolleys have since been converted to buses, Jones Hill, like the rest of Dorchester, has retained its diverse collection of residents and housing styles as well as its accessibility to transit. Since 1928, as part of the Dorchester Extension of today's Red Line, subway cars have shuttled Dorchester residents between Dorchester and Boston along the same original Old Colony Railroad right of way used by commuter rail trains. In the 1950s, Interstate 93 was built along the original Old Colony Railroad right-of-way through Dorchester, creating a space shared by private automobiles, subway cars and commuter rail trains. 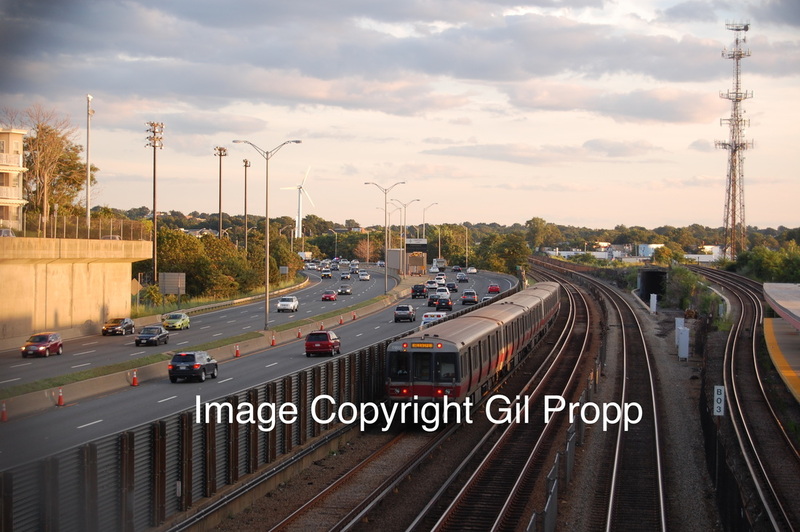 A MBTA Red Line subway train passes Savin Hill Station at right, with Interstate 93 and a classic Dorchester triple-decker at left. Walking up Jones Hill today, the evolution of housing styles is evident. By the Downer Avenue-Sawyer Avenue intersection, there is a wide range of homes. 76 Downer, the most prominent, dates back to 1885 and is a later part of the wave of upper-class home construction around the railroads. 97 Sawyer Avenue, at one point home to civil rights activist William Trotter, dates back to 1890, just as electric trolleys were beginning the be built through the area. Later homes tend to be smaller and more multi-family focused. Homes such as 97 Sawyer and those beside it were originally built as single-family homes; some, such as 97 Sawyer, remain single-family dwellings today, and others, such as the 1900-built 95 Sawyer, were later converted to multi-family. The triple-deckers that were built around these larger homes around 1915 are built specifically to house three units. Looking up Sawyer Avenue from Downer Avenue towards 95 Sawyer, one sees everything from former mini-estate homes with carriage houses (76 Downer at left) to homes built as single-family dwellings (95 and 97 Sawyer at right) to triple-deckers. 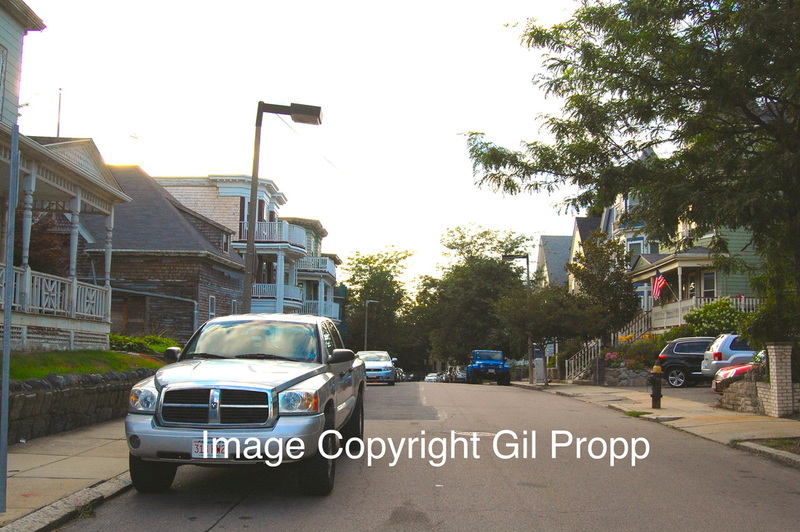 The top of Jones Hill was slower to develop than other areas of Dorchester, largely because of its steep hilltop location. Hilltop land was more desirable, for reasons ranging from views to hilltops being strategic locations to avoid basement flooding, and likewise more expensive to purchase. Accordingly, single-family homes were still being built on Jones Hill in the early 1900s, when triple-deckers were the predominant construction in Dorchester, and the triple-deckers that line Downer Avenue today were built later than most, around 1915. 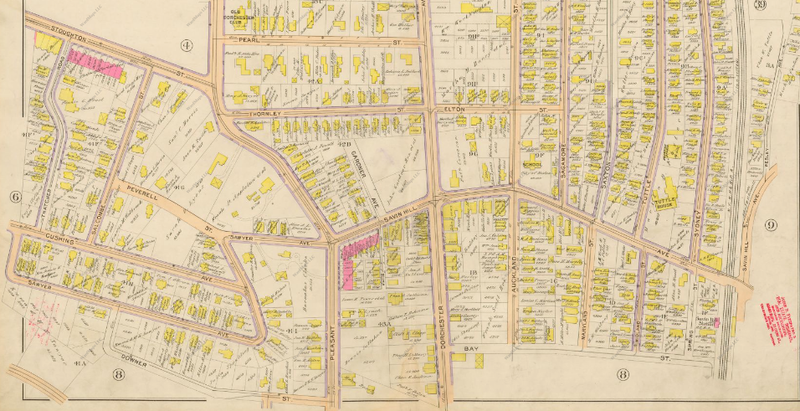 1910 Bromley map showing just how much empty land there still was along Downer Avenue on Jones Hill in 1910, by which time most of Dorchester was densely developed. Note that there is still a large estate—that of Julia Spaulding—along Downer Avenue. The triple-deckers around the Downer Avenue-Sawyer Avenue intersection tend to be more solidly constructed than most, as they were built by wealthier families who could afford to buy hilltop land on Jones Hill. Accordingly, the basements of some of these buildings feature granite foundations, making them immune to flooding and ensuring that the structures will last for years to come.